Museum Contemporary Exhibition as published in The Times on 10 August by Michael Tillotson. Known for courage, endurance and irrepressible humour, the Gurkhas epitomise all that is fine in the soldier. Admirers will be glad to hear that while other regiments face the loss of a battalion as the Army is whittled down to the 82,000 men of the regular force by 2020, the Brigade of Gurkhas is to hold its own in the order of battle. The reason is not hard to find. These are the best of the best; recruits are drawn from 11,000 annual applications of which only a few hundred are selected. They are long-term soldiers striving to serve to full pension while learning to equip themselves not for retirement but for communal responsibility in the hills of Nepal. In anticipation of the Army of 2020 the Gurkha Museum in Winchester has mounted an exhibition to remind us of what Gurkha soldiers have achieved over the past 200 years, most recently in Afghanistan, plugging the manpower gaps in other regiments, providing support as sappers, signallers, drivers and in the role in which they are seldom thought of — administrators and clerks. A glance back to the Sepoy Mutiny that began in Meerut on May 11, 1857, tells of their outstanding loyalty to the British Crown. As the sepoys of East India Company regiments slaughtered officers and their families, the Sirmoor Battalion recruited from Nepal — not yet riflemen — marched the 150 miles from Dehradun to Delhi to be the first locally raised regiment to fire on the mutineers. Then they held a crucial sector of the ridge overlooking Delhi for three months in the face of persistent attack. Subsequently the Gurkha Brigade, as it was known pre-1947, fought in all the Indian frontier wars, marched with Roberts from Kabul to Kandahar in 1880, raised more than 30 battalions in the First World War and almost 50 in the Second World War. Postwar, they fought in Malaya, North Borneo and the Falklands. Now, the original ten rifle regiments — briefly 11 on the raising of 11th Gurkha Rifles in 1918 — are reduced to one of two battalions in British service. Six regiments joined the new Indian Army after Partition in 1947 and the four remaining, 2nd, 6th, 7th and 10th, were amalgamated into the new Royal Gurkha Rifles of three battalions in 1994. These were reduced to two when the regiment left Hong Kong in 1996. The exhibition, The Contemporary Brigade of Gurkhas, traces this heroic service in pictorial detail, while providing a graphic summary of more recent service of the Royal Gurkha Rifles, the Queen’s Gurkha Engineers, Queen’s Gurkha Signals, the 10th Queen’s Own Gurkha Logistic Regiment, the Regimental Band and the most recently formed Gurkha Staff and Personnel Support Company. There was once a briefly held view that Gurkhas were not suited for training as sappers and signallers but they reached the highest standards. The Conspicuous Gallantry Cross won in Afghanistan by Sergeant Dipprasad Pun for his bravery and resource in single-handedly driving off an attack on his lightly held position in September 2010 is at the heart of the display. One Gurkha rifle company served in Iraq to bring another battalion up to operational strength and the 1st and 2nd Battalions of the RGR served three and four tours of operational duty in Afghanistan respectively over the decade up to 2013, winning other gallantry awards and renewed regard for their courage and dedication. Gurkhas drawn from all units will continue to man the Training Team Brunei that runs the British Army’s Jungle Warfare School for officers and NCO instructors and also the Ground Sign Awareness Instructors’ course. The is latter for those training soldiers of all ranks in the constantly changing indications of the presence of enemy explosives laid in the path of men and vehicles. On entering the exhibition, visitors will recognise with a shudder the soldier in the protective clothing and equipment demanded for detecting and dealing with IEDs — the improvised explosive devices that have inflicted so many casualties to NATO troops in Afghanistan. The imperturbable figure is an eerie reminder that cold courage is as much a part of the Gurkha psyche as that required in the heat of battle. 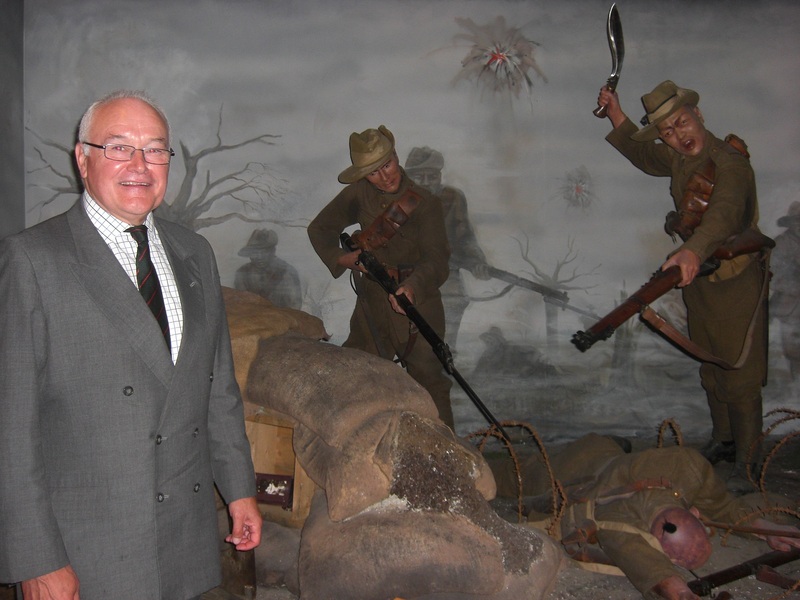 The exhibition was opened on August 2 by the Colonel Commandant Brigade of Gurkhas, General Sir Peter Wall, a former Queen’s Gurkha Engineer and now Chief of the General Staff and Head of the Army. 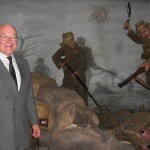 It will be the last of many displays prepared by Major Gerald Davies, who retired a few weeks ago after 11 years as Curator of the Gurkha Museum.